After traveling the state of Kansas for the past few years, hitting up as many waterfalls as possible, I thought it was time to make a fun little Kansas waterfall list! This year, I’ve made it a point, with all the rain, to try and hit most of the ones I’ve yet to visit. I’m up to over 60 of nearly 80 waterfalls that I have on my list. That’s a lot, considering most people don’t even realize there are waterfalls in the state of Kansas! I recently published my map of Kansas waterfalls on my new website, Kansas is Beautiful. Before I begin, if you just want to view all the Kansas waterfall photography, I’ve set up a gallery of all the waterfalls I’ve visited in Kansas located on my Kansas waterfalls photo gallery! Geary Falls are located just south of Junction City. I’ve now visited this waterfall three times and it’s become my favorite after the most recent trip. In late April, I visited when early morning fog and heavy rains had a very mystical feeling to the falls. The only downside to Geary Falls, like most spillway falls in Kansas, is when the water is running low, they nearly dry up. But when they’re flowing, they’re really flowing! The main viewpoint is from the top of the falls, but if you follow a little path down through the trees and do a bit of rock-hopping on the creek, it leads you to the vantage point from below the falls where this was shot. This was also one of the first Kansas waterfall I ever visited. Prather Creek Falls, also known as Chase Lake Falls, may not be the tallest of all the waterfalls in Kansas, but it’s become one of my absolute favorites! There are three tiers to this waterfall. The middle being my favorite, is pictured above. Prather Creek Falls are pretty easy to find. Just head out to Chase State Fishing Lake to the east of Cottonwood Falls and park at the dam. Walk across and follow the spillway down the creek to stop at each layer of falls. 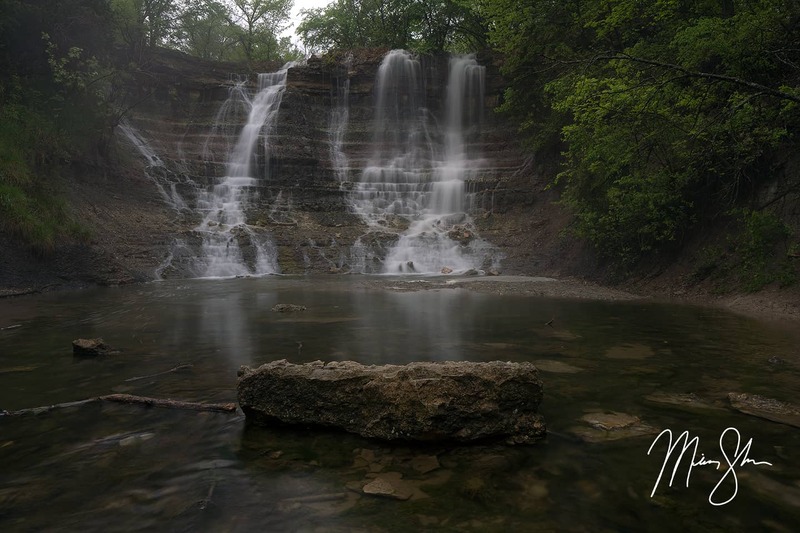 Each of the three tiers seem to offer a new angle to photograph them, and depending on the day of the year and time of day, sunlight can hit these falls just perfectly to light them up! If you’re driving the Flint Hills Scenic Byway, this is one stop that’s absolutely worth the extra couple of miles to visit Chase State Fishing Lake! Santa Fe Lake Falls might be the best kept secret in the Wichita area! While most lake-goers head towards Cheney and El Dorado for their lake fun, there’s a smaller lake between Augusta and Andover called Santa Fe Lake that offers some Kansas beauty. Growing up, I visited this lake on many occasions, as my grandparents lived a mile or two down the road, but I never knew the lake harbored this beautiful waterfall until more recent times. 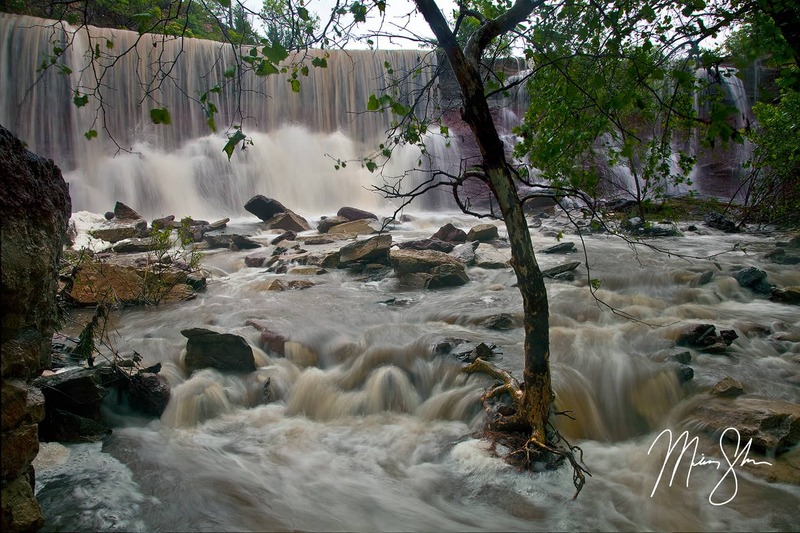 Located in the spillway of Santa Fe Lake, this waterfall is awesome when the water is flowing! These falls shouldn’t be confused with the waterfall of the same name of Santa Fe Lake Falls that are located in the spillway of Santa Fe Lake in Edgerton, Kansas near Kansas City. Cowley Falls are my go-to falls when I know there’s been some rain. They almost never disappoint (other than a visit in drought conditions), and when they are in full flow, like the above photo, there’s some great angles to view them from! The typical lookout point is above the falls to the west, near the parking lot. But a sketchy path can take you down towards the base of the falls. It’s worth the hike down, as you get views like the above photo! I would almost consider moving Cowley Falls up above Santa Fe Falls or even Prather Creek Falls, but the amount of littering people have done here has left a lot of broken glass and trash at the site. Still, if you can overlook that negative, Cowley Falls can be extremely impressive! Just be careful of the broken glass if you trek down to the base of the falls. I found Chautauqua Falls by accident while Google Mapping one day. And they sure don’t disappoint! 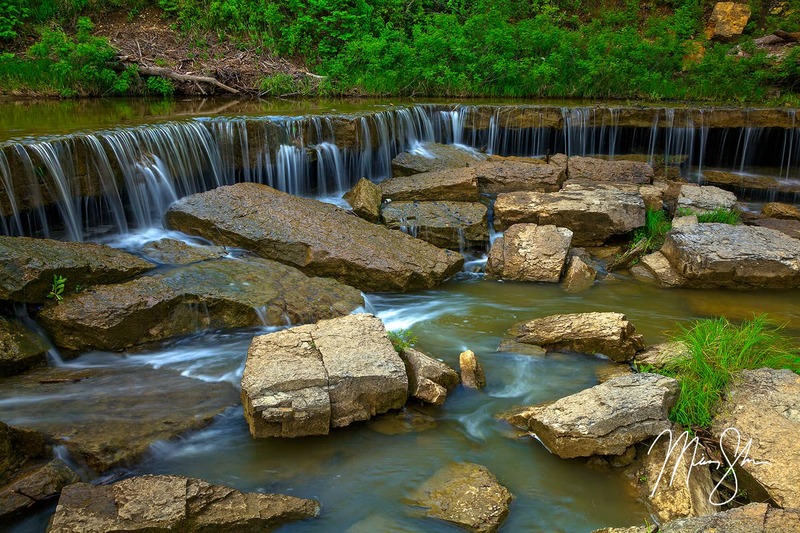 Located near Sedan, Kansas, these beautiful falls are similar to Prather Creek Falls, as there are numerous drops along the creek. 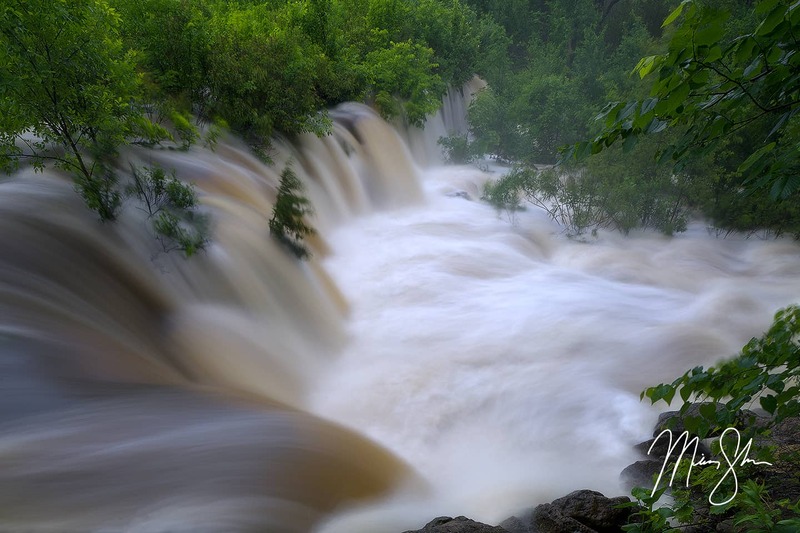 The photo above showcases part of the upper falls during high rainfall. Depending on rainfall amounts, this waterfall has multiple drops, sometimes including a twin or triple set of falls at the top. Below these is a smaller drop that can provide a more intimate waterfall to view, as it drops off a flat shelf and gets wider as more water flows over. Rock Creek Falls are another set of falls like Prather Creek Falls that have multiple drops within a hundred yards of each other. At the top is the spillway. It’s man-made, but still pretty. But below that are the falls pictured above. And further below that are a number of smaller shelf-like falls that are equally as pretty! Rock Creek Falls can be found by visited Rock Creek Lake west of Fort Scott in eastern Kansas, and following the creek between the lake spillway and Marmaton River. 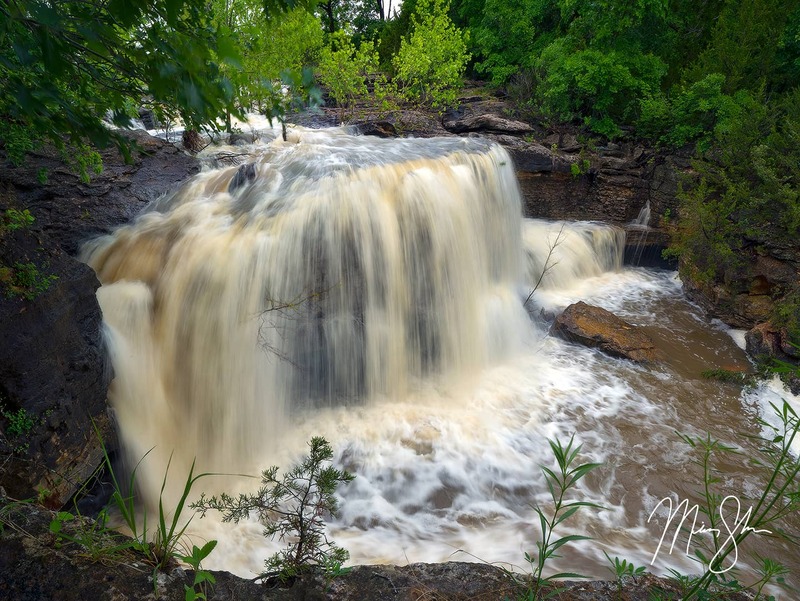 These falls are just a few miles west of the Frontier Military Byway. 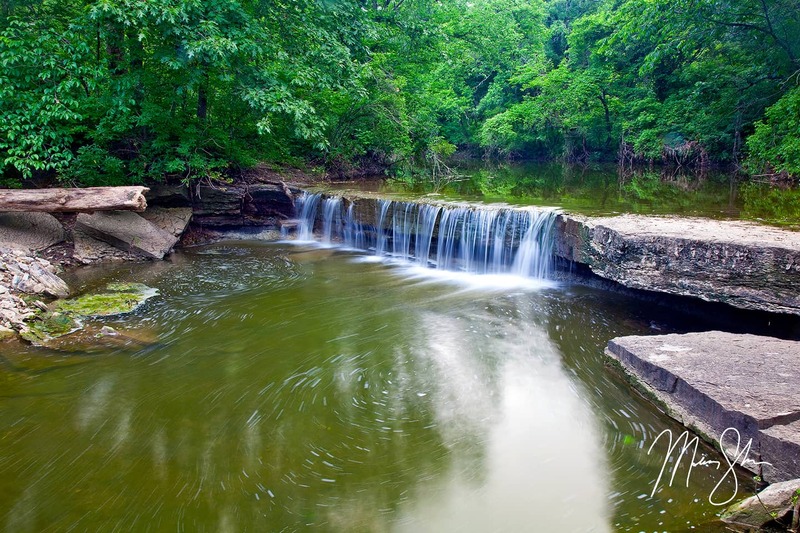 Located along the Landon Nature Trail, southeast of Topeka, Swissvale Falls are a true natural gem. 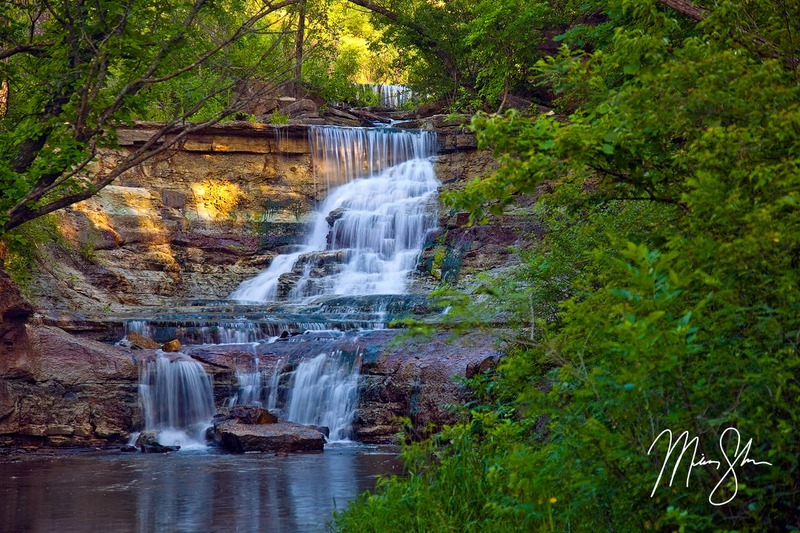 They’re not the tallest waterfalls in Kansas, but they have a certain charm that makes them beautiful! The drop is probably only 4 feet or so, but spans the entirety of Camp Creek. They can be found just north of the small town of Overbrook, Kansas. If you’re trying to visit from the road, it’s a good quarter to half mile walk up the Landon Nature Trail to Camp Creek. Just use the map in the link above to find the location. Butcher Falls are located on Red Buffalo Ranch, which is owned by Bill Kurtis, a native Kansan famous for broadcasting. It’s located to the northwest of Sedan, Kansas is some beautiful Chautauqua Hills country! The falls drop a good 10-15 feet between boulders into the pool below. You can even stay on the ranch in the Butcher Falls Bunkhouse! 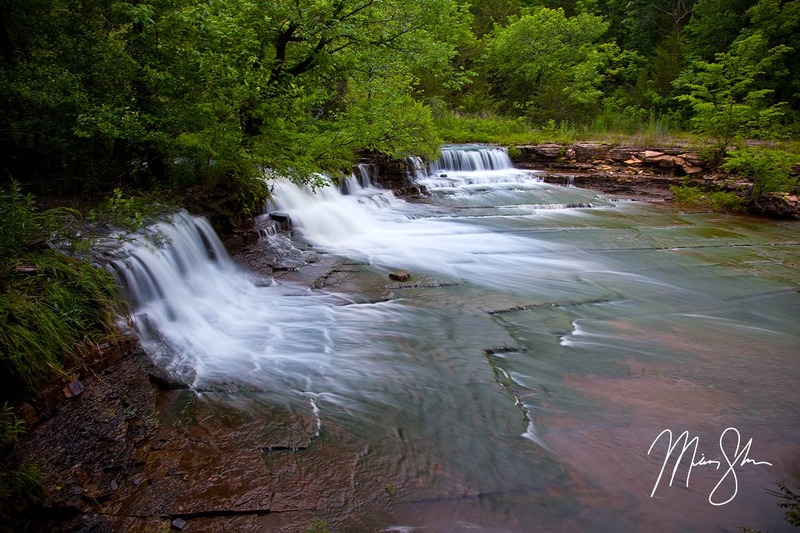 This is one of the few non-spillway natural waterfalls in the state! Angel Falls are actually located inside the city limits of Lansing, Kansas in northeast Kansas. They make a great stop on the south end of the Glacial Hills Scenic Byway or north end of the Frontier Military Historic Byway. You can find them along the nature trail south of St. Francis de Sales Catholic Church in Lansing. Angel Falls makes for great photography in the fall when autumn leaves swirl around in the pool below. 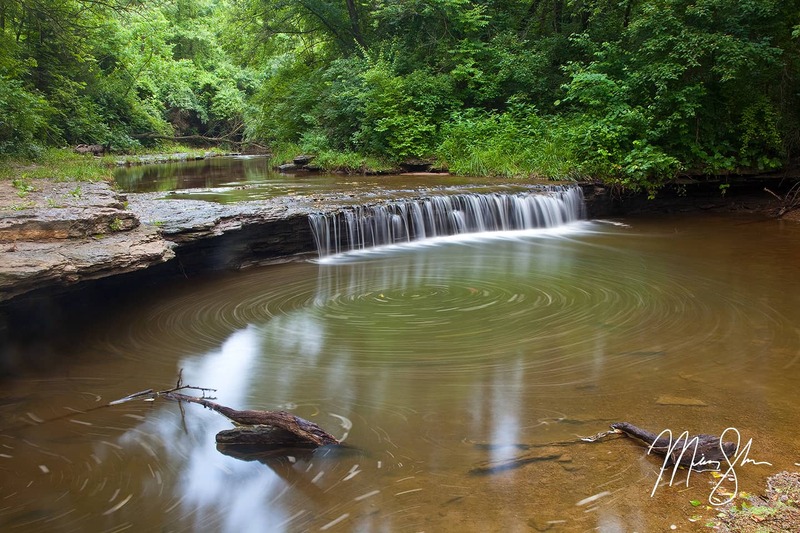 Pillsbury Crossing, also known as Deep Creek Falls, are probably the most famous of all waterfalls in Kansas. They certainly deserve their fame, as they are gorgeous in any season of the year! Located to the southeast of Manhattan, Pillsbury Crossing can also be a favorite hang-out spot of folks from Manhattan and surrounding areas. If you visit on a nice day, it’s quite likely you will not have these gorgeous falls to yourself! Keep in mind, there are also a few waterfalls I haven’t visited yet that might make moves on this list in the future. When I do, I’ll revisit this list once again to see if they can knock some of the beautiful waterfalls above out of the top 10! 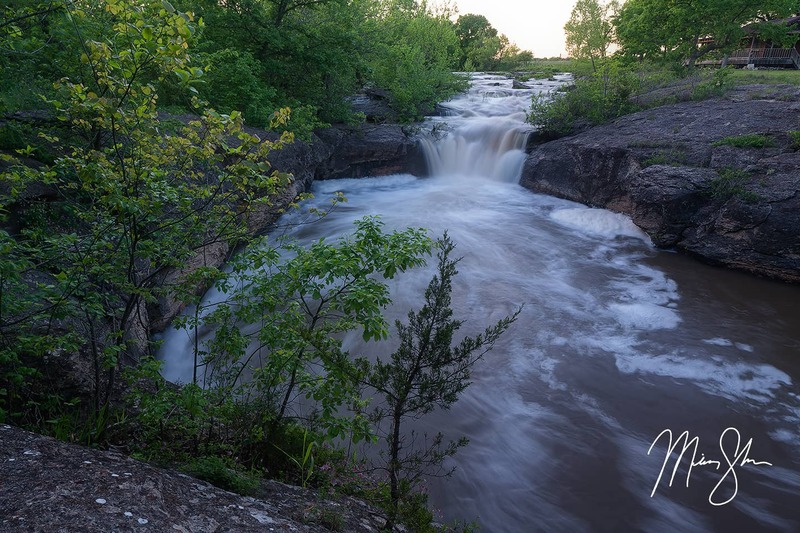 For a full list of waterfalls, visit the Kansas is Beautiful waterfall map and don’t forget to visit the Kansas waterfall gallery to view all my Kansas waterfall images! 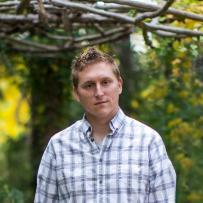 Mickey Shannon is a travel and landscape photographer based out of Wichita, Kansas, USA. He has traveled to Switzerland, France, Canada and all across the United States.